Bernice and Paul Noll travelled the world and share their stories. 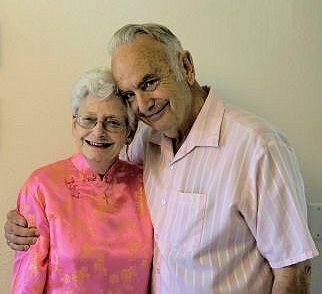 For many of us, saying we've "been there, done that," often means "okay, we've been to a few places, done a few things, and that's it"
But Bernice and Paul Noll, a Eugene couple, both in their 70s, have taken that "been there" phrase to a whole new level. Accomplishments range from flying their own plane to a variety of destinations during a around-the-world trip, from the furniture Paul makes to the numerous computer books he has written. It's not over, either, for the Nolls were scheduled for yet one more short business/teaching trip to China starting this month. And then there are the classes the Nolls teach at various locations around Eugene. For example, this spring, Paul and Bernice taught a class at the Oasis Center for older adults. The subject: "The 56 national minorities of China." The presentation included a display of traditional garments that the couple collected during their travels.